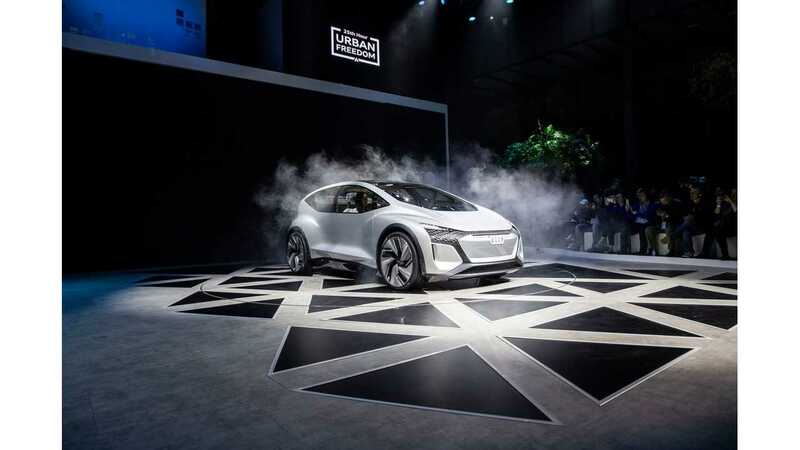 Audi unveiled at the 2019 Shanghai Auto Show its all-new all-electric autonomous concept car - the Audi AI:ME which the name refers to the Audi AIcon, a previous self-driving concept. The car looks like a cool, futuristic city hatchback. The AI:ME is equipped with a 65 kWh battery and 125 kW electric motor. The on-board computer is able to drive autonomously in specific areas (Level 4) like highways or a specially equipped area in inner cities. "What is long established in rail transportation and even aviation is at the threshold of a breakthrough in automotive transportation—automated driving. The Audi AI:ME is designed for use in the city and for driving at what is known as level 4. This is the second-highest level on a standardized international scale for increasing automation. Although systems with level 4 do not require any assistance on the part of the driver, their function is limited to a specific area—such as highways or a specially equipped area in inner cities. In these places, the driver can completely transfer the task of driving to the system. The driver needs to resume the task only when the car leaves the area defined for fully automated driving. By contrast to the Audi AIcon, a vehicle with level-5 function that is always fully autonomous, the Audi AI:ME is therefore equipped with the traditional steering wheel and pedalry control elements in addition. 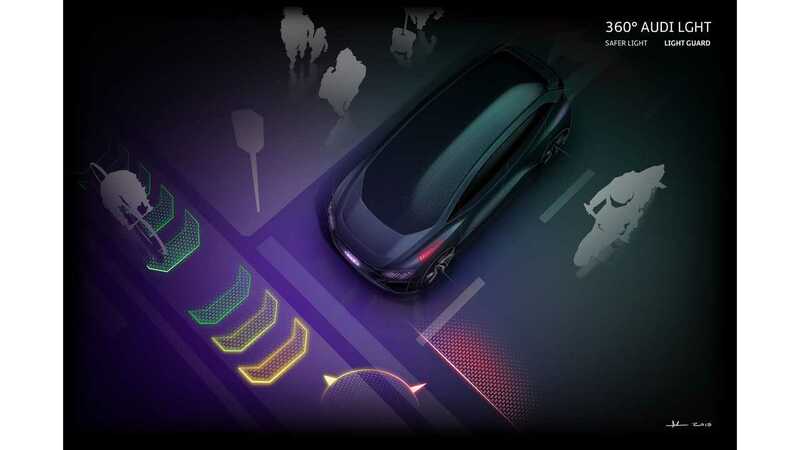 This means that the car, as well as the remaining road users, will drive automatically in a defined traffic area equipped with the corresponding infrastructure in the future. Self-regulating and self-controlling flows of traffic allow the vehicle to glide along calmly, avoiding heavy longitudinal or lateral acceleration. This is an important requirement for the occupants of the car to be able to detach themselves mentally from the traffic around them." The interior of the car - thanks to short overhangs and the flat battery in the floor - is spacious. There are two seats in the front (yeah, no surprise there), but the rear compartment can be managed in various ways. "For the occupants, the compact drive package offers a maximum amount of objectively available space, spatial comfort, and a great deal of variability. The Audi AI:ME is designed as a 2 plus-x-seater. Its layout relies on a variety of configurations for seat positions and stowage space. While only the individual seats at the front will be used during most journeys, the car offers space for up to four people in the front and on the rear bench if necessary." At Auto Shanghai 2019, Audi is introducing a visionary mobility concept for the megacities of the future: The showcar, known as the Audi AI:ME, offers compact dimensions, a spacious, futuristic interior, and the ability to drive autonomously at level 4. This allows the occupants to do what they like with their time on board. The Audi AI:ME offers a broad range of high-tech features for communication, entertainment, or simply relaxation. With an exterior length of 4.30 meters (14.1 ft) and a width of 1,90 meters (6.2 ft), the Audi AI:ME takes up as much traffic space as a present-day compact car. However, the wheelbase of 2.77 meters (3 ft) and the height of 1.52 meters (5 ft) indicate interior dimensions that are more likely to be found in the next higher class at least. This is made possible by the architecture of the electric drive. It allows for short overhangs and a large-volume interior without a propeller shaft tunnel. The drive unit is positioned on the rear axle and mobilizes 125 kW (170 metric hp). For the occupants, the compact drive package offers a maximum amount of objectively available space, spatial comfort, and a great deal of variability. The Audi AI:ME is designed as a 2 plus-x-seater. Its layout relies on a variety of configurations for seat positions and stowage space. While only the individual seats at the front will be used during most journeys, the car offers space for up to four people in the front and on the rear bench if necessary. This means that the car, as well as the remaining road users, will drive automatically in a defined traffic area equipped with the corresponding infrastructure in the future. Self-regulating and self-controlling flows of traffic allow the vehicle to glide along calmly, avoiding heavy longitudinal or lateral acceleration. This is an important requirement for the occupants of the car to be able to detach themselves mentally from the traffic around them. Audi AI fundamentally changes how automobiles are used and significantly enhances the time spent on board. The car is increasingly becoming a “third living space” alongside our homes and workplaces. It is thus only consistent that the Audi designers did not subordinate the interior of the Audi AI:ME to the shape of the body. On the contrary. They prioritized the interior and made it the core of the whole vehicle. The focus here is less on the traditional connection between driver and vehicle—steering wheel, instruments, pedals—and more on the time spent in the automated vehicle. This is why these control elements are retracted with an elegant and sophisticated choreography and are then almost fully concealed by a stowage compartment with a surface made of open-pore walnut wood. In general: Stowage space will become more important than before in automated vehicles. The Audi AI:ME features large areas both on the cockpit cover and between the front seats that conceal a further innovative detail: Magnets serve as cup holders and hold metal cups or plates in place as required. Occupants can enjoy a relaxed meal while riding in the automated Audi AI:ME. No matter what they are doing, the passengers can always find a comfortable seating position. The front seats are inspired by the classic lounge chair and feature a wide, comfortably cushioned seat, upholstered with textile material in warm shades of gray. The backrests are designed as curved shells that are attached to the seat cushion only with a vertical carrier. When the pedalry is not needed, drivers can rest their feet on the supports under the dashboard, such as on an ottoman. On the rear bench, which reaches around to the side sections of the car, occupants can vary their seating position almost any way they like. The horizontal angle in the deep window in the interior is a significant element of the side section—a feature quoted from the Audi AIcon, so to speak. It offers an obvious ergonomic advantage to the occupants: It extends the range of motion of the arm resting on the door rail and also visually increases the size of the entire interior to a significant degree. The vehicle and as the communication and interaction systems are operated by means of eye tracking, voice input, and touch-sensitive fields in the door rail. They are positioned perfectly in terms of ergonomics and are normally integrated into the surface, making them invisible. The lighting is activated only when approached, and guides the user’s gaze to the functional surfaces. 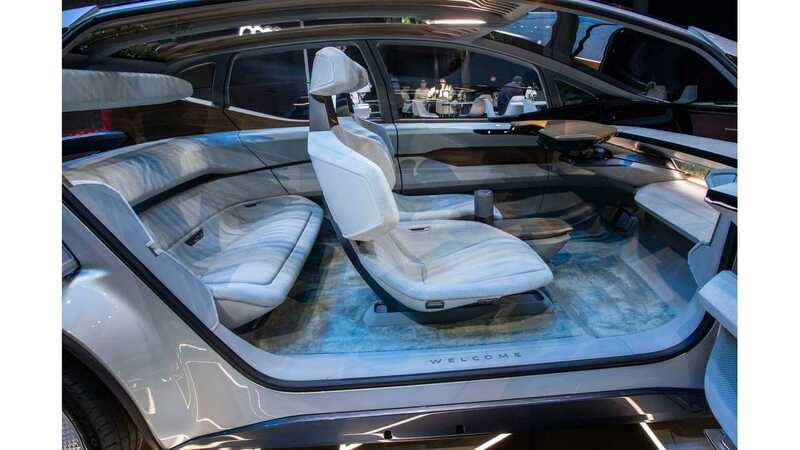 There is a multifunctional, three-dimensional OLED monitor that runs below and along the entire length of the windshield and is used primarily in dialogue with eye-tracking control. Terminologically coded function menus, for example for navigation or infotainment, can be activated with the eye and then open up further levels that move from the background into the sharp view mode on the 3D monitor. There are VR goggles on board for the visual output of the infotainment system. They turn Internet use, watching movies, or even interactive gaming into a fascinating experience for the passengers. Audi demonstrated the possibilities that await us in the future with the Holoride system at the CES 2019 in Las Vegas. Here, the vehicle’s own movement is detected by a sensor system and then integrated interactively into the visual course of a game. Passengers feel like they are literally in the midst of the action. The occupants experience the interior of the Audi AI:ME not simply as a means of transport, but as a luxurious atmosphere with numerous high-tech features. It also literally acts as a filter that keeps out the omnipresent traffic all around. The high-quality audio system is coupled with noise compensation that can completely suppress the outside noise level by means of active noise control. This allows occupants to enjoy meditative silence or listen to music in concert-hall quality in the Audi AI:ME. Surfaces and structures that are familiar from the home environment dominate even in terms of the materials. High-quality textiles, some of which are made of recycled products, wood, and the touchpads in the door rails made of the mineral composite material Corian, which is particularly pleasant to touch, give the predominantly technical character of the vehicle a cozy and luxurious touch. The interior gets its special ambiance from the tension between the natural and technological elements. Large glass surfaces in the deep windows and the roof area make the interior light and transparent. Electro-chromatic control can insulate the entry of light and heat if necessary, and shield the interior with the continuously tintable windows. Filigree wooden struts in the roof area create a pergola above the interior. The use of real plants in the interior of the automobile is a first. Vegetation, which is rarely found in the hostile city environment, gives occupants a feeling of proximity to nature and helps to objectively improve air quality in the automobile at the same time. Sophisticated filter technology prevents odors from traffic and the city from entering into the interior of the Audi AI:ME in the first place. Systems that determine the stress levels for vital parameters also serve the wellbeing of the occupants. Intelligent algorithms allow the Audi AI:ME to get to know the driver better and better and improve their options in a specific manner. The exterior differs strongly from the mainstream competition. The Audi AI:ME is a targeted alternative design. More than just a hint of a wedge shape, the accentuated and drawn out wheel wells that are typical for the brand and the striking window graphics create a highly emotional overall shape. The traffic area is clearly subordinate to the small space requirement: With an exterior length of 4.30 meters (14.1 ft) and a width of 1.90 meters (6.2 ft), the vehicle fits into the compact car segment. Its height of 1.52 meters (5 ft) offers great advantages in the interior in particular, and gives occupants a sense of ample space, makes it easy to get in, and offers excellent headroom. The large side doors that open in opposite directions and are fastened at the front and back also facilitate getting into the vehicle. And yet, the Audi AI:ME does not appear as a cubic van, but exudes dynamism even at a standstill. Large 23-inch wheels emphasize this appearance. With the self-driving cars of the future, headlights will have a part-time job at best because the driver will be concerned with other things most of the time and will rarely need the road to be brightly illuminated. It is another function of the lighting that takes on a more important role here: communicating with other road users. The Audi AIcon already demonstrated how digital matrix luminous surfaces can use moving graphics to output clearly understandable signals relating to the driving condition and, of course, also to mark the vehicle itself. The Audi AI:ME takes this approach one step further: As road users come even closer in the city, the traditional positions of the front and rear lights are often not visible. Because of this, Audi lighting designers integrated LED elements in the body in an unusually high position above the wheel wells, where they are visible from all angles. This 360-degree communication is an important additional safety feature for pedestrians or cyclists. Like in the AIcon, the LED units at the front and the micro matrix projectors can use easily identifiable symbols to signal to pedestrians when the AI:ME is letting them cross the road, for example. The graphics can be projected onto the road or a wall. This function is also used to illuminate the door area to ensure that occupants can enter or exit the vehicle safely and also to mark the vehicle for other road users. The matrix projectors can also provide additional safety to other road users with weaker lighting by automatically illuminating their surroundings. The Audi AI:ME features a further innovation: It can interpret signals from other vehicles and use its own lighting technology to amplify them if this benefits the surroundings. Example: A vehicle driving in front indicates danger with faint hazard warning flashers. The AI:ME can detect this signal and amplify it with projections and the LED units on the body so that it is clearly visible to all road users. As a level 4 vehicle, the Audi AI:ME is equipped with bright LED headlights and perfectly visible brake and tail lights for all those situations in which drivers take the wheel themselves. When driving actively, being able to see is just as important by night as it is by day in the future, too. Audi took a targeted approach to tailoring the specifications of the AI:ME to the scope of use of a city car. This means that extreme acceleration values and top highway speeds are just as obsolete as high cornering speeds and ranges that are suitable for driving long distances. An automobile like the AI:ME will drive predominantly in the speed range between 20 and 70 km/h (12.4 and 43.5 mph) and will often have to remain mobile for hours at a time without charging. However, long ranges in terms of kilometers are less relevant than the ability to make good use of the operating time. The engineers therefore drew on a comparatively simple, yet light, basic configuration. A battery unit with a storage capacity of 65 kilowatt hours is sufficient for meeting these requirements. A permanently excited synchronous motor that can mobilize 125 kW (170 metric hp) if necessary operates in the area of the rear axle of the AI:ME. A fraction of this is usually sufficient for keeping up with the flow of city traffic. Thanks to brake energy recuperation and its comparatively low weight, the Audi AI:ME exhibits extremely low energy consumption even in city traffic. The axles and other components of the suspension are found in the portfolio of compact sister models of the Audi portfolio. The tried and tested combination of adaptive dampers and small unsprung masses ensures good ride comfort in the city. The body is made of a light-weight multi-material compound consisting of high-tech steel, aluminum, and plastic components, particularly in the attachments. After the Audi AIcon, which debuted at the International Motor Show in 2017, and the radical Audi PB 18 sports car, which was introduced in the summer of 2018, the Audi AI:ME is now the brand’s third vision vehicle to present an offer for use in clearly defined areas (“use cases”). While the Audi AIcon offers the qualities of a business jet for long-distance drives, the PB 18 is a vehicle for the occasional trip to the race track. The Audi AI:ME is the perfect companion for use in conurbations. A fourth vision vehicle will complete the concept quartet at the International Motor Show in September 2019. The top priority given in the specifications for these test mules is not to design an all-rounder for the versatile and long-term spectrum of use of a heterogeneous clientele. These are highly specialized premium automobiles that can be ordered as needed and with extensive possibilities for individualization as part of an on-demand offer. This approach is based on the requirement profile of many customers, especially in urban areas, which is undergoing a transition. Automobiles are to be available and ready for use upon request and should ideally be custom tailored, but they need not pass into permanent personal ownership. However, premium customers still demand that they can order their automobiles with as many individual features as possible—and, of course, with the same high quality they are used to and expect—from the Audi. Customers who book a vehicle will then not only get their desired vehicle, but can also have it configured to suit their personal preferences as far as possible. The color, interiors, and technical options can be pre-configured online with the app or via the driver details stored in the “myAudi” system. Even drivers’ preferred interior temperature, the perfect ergonomical seat adjustment, and their personal music library are already activated when they get into the car. This offer is accessible and easy to use via an app that connects the vehicle order, personal preferences of the user, and numerous options that can be used while driving. Users make use of this app to order their Audi AI:ME and can preorder the car with two or more seats, and even a child’s seat, as required. They will find the AI:ME at the requested time and in the agreed-upon place and can simply park it somewhere after using it. In zones with the appropriate equipment, the vehicle can even travel between the depot and the customer’s address without a driver. The app, which is operated via a smartphone and in the car itself, also serves as an assistant and intermediary for many other services. For example, it can be used for spontaneous communication with friends via the Internet or social media. Users can take selfies on board and share them in social networks. They can access the entire Internet for the purposes of entertainment, research, and service. Users can order food on the way and make a quick, automated stop at a restaurant to have it delivered to the car, and then enjoy their meal in the vehicle on their way home. The connection between the user’s home network and the Audi AI:ME even allows users to continue watching a movie using the VR goggles in the car, picking up where they left off at home. On their way home from work, they can close their eyes, enjoy the silence on board, and relax. The Audi AI:ME becomes a fixed point in its user’s personal digital biotope. The tedious daily journey from A to B turns into an enjoyable ride with free time. After they have arrived at their destination, the users can get out of the car, relaxed and in good spirits, and do not even have to look for a parking spot or charging station. The Audi AI:ME will find its own way back to the depot. “Audi on demand” is available in metropolises on several continents and is already the perfect example of the future expansion of Audi’s offer into a global mobility service provider. With the simultaneous expansion and specialization of the vehicle fleet, this program will become even more attractive to customers with high demands in the future. The premium vehicle offer itself and the digital integration of the automobile and living environment will give the Audi brand a head start in this segment, too: Vorsprung durch Technik.